Membership-only, LGBT themed, clothing optional camping resort. Welcome to The Woods Campground! The online reservation tool is now live. make reservations or be a guest at The Woods Campground. Please click here to create your membership. Our 2019 weekend schedule is posted. Please be aware that changes to events are likely, so check back often for updates. Daily Passes are a great way to experience The Woods!!! Voted Best Facilities - Best Amenities - Best Activities! 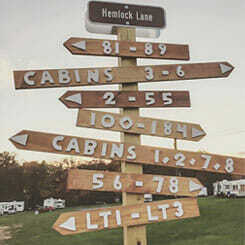 Welcome to The Woods Campground in the beautiful Pocono Mountains of Pennsylvania! This membership-only LGBTQ, clothing optional campground, exclusively for the 18-and-older crowd, is located on 161 private acres with streams, four-acre lake, and spacious campsites. We have a variety of sites for seasonal campers, trailers, and popup campers, as well as tent camping. Don’t have your own equipment? 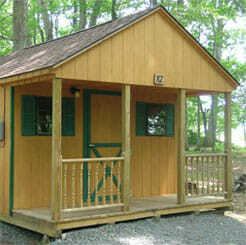 We have 20 cabins, 1 luxury trailer and 2 park model resort homes to rent! We are Class A motor home friendly with most sites offering 50 amps!